As more and more people go online, the digital publishing industry has grown to keep up with the latest technology. 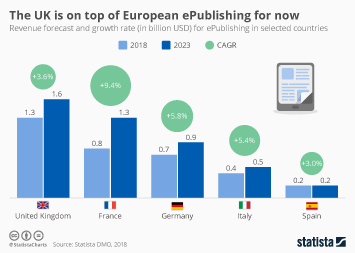 As a result, digital publishing revenue grew to nearly 18 billion U.S. dollars in the United States in 2018. The average revenue per user for digital publishing in the United States is approaching 79 U.S. dollars per capita and continues to trend upwards indicating a healthy forecast for the industry’s future, despite the fact that the total user base seems to have plateaued in recent years. Before the age of digital disruption, Americans were exclusively reading paper versions of books and magazines, but now they are turning to e-books and e-magazines along with other, more advanced formats of published media. Around 266 million e-books were sold in the U.S. in 2017 alone, a number which has grown substantially since the technology started to become mainstream around 2010. Amazon has established itself as the market leader in this industry with hundreds of millions of e-book sales, and the most popular e-reader brand: “Kindle”. Throughout the publishing industry, consumers are demanding more digitalized products, but willing to spend less on a product that lacks a physical form. E-magazines and E-newspapers are their respective industry’s answers to digital disruption, although they are yet to develop the following that print versions had in the past. The number of digital magazine readers has grown to over 20 million, and the popular The New York Times has accumulated over 2.5 million digital only subscribers on its own. Around 15 percent of consumers state that they read online newspapers on a daily basis, with another 16 percent responding that they read them several times per week, giving the industry a relatively stable base from which to grow.